Sears Kenmore 148.12182 balance wheel. Needs cleaning. Sears Kenmore 148.12182 presser foot bar assembly. Sears Kenmore 148.12182 presser foot thumb screw. Will adjust for First Class ship. Sears Kenmore 148.12182 shift guide part 200104. Needs cleaning. Sears Kenmore 148.12182 terminal box, part # 200888. Sears Kenmore 148.12182 thread cutter. Will adjust for First Class ship. Sears Kenmore 148.12182 top cover. 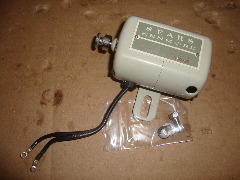 Sears Kenmore 148.12182 feed dog, needs cleaning. Remove rust with Evaporust. Sears Kenmore 148.12182 hook. Needs cleaning. Sears Kenmore 148.12182 motor. 1 Amp. Runs well. Sears Kenmore 148.12182 rod connecting to drop feed knob. Sears Kenmore 148.12182 presser foot regulating screw. Needs cleaning. Sears Kenmore 148.12182 set screws. Will adjust for First Class ship. Sears Kenmore 148.12182 slide plate. Has minor pitting and rust. Needs cleaning. Sears Kenmore 148.12182 thread guide part 202073.